(MENAFN - DailyFX) TALKING POINTS NOK,SEK, US INDUSTRIAL PRODUCTION, GERMAN ZEW SURVEY Nordic economic docket remains light NOK and SEK eyeing external risk German ZEW Survey and US industrial data may be key volatility triggers What is the policy outlook for Riksbank rate decision meeting this month? See our free guide to learn how to use economic news in your trading strategy ! The economic docket in Sweden and Norway remains blank for today's trading session, probably leaving NOK and SEK at the mercy of their cross-currency counterparts. As outlined in the weekly fundamental outlook , the Swedish Krona and Norwegian Krone's price action will likely be dictated by key growth announcements and indicators out of the US and Europe. US industrial production data will be released today, with forecasts of a 0.2 percent month-on-month expansion following a downward revision of last month's report to a flat result. US economic data has been broadly underperforming relative to economists' expectations since February, and this has prompted the Fed to adjust its outlook on rate hikes as growth continues to show greater weakness. Elsewhere, the German ZEW survey a measure used to gauge analyst sentiment will be published. Traders will begin to pay attention more closely to key sentiment and leading indicators out of Germany as the 'steam engine of Europe begins to sputter and casts a dark cloud over Europe's outlook. This comes amid broader regional underperformance and waning PMI surveys as continental demand wanes. Swedish Krona traders over the next week may begin to get a little hot under the collar as the Riksbank prepares to deliver its rate decision, accompanied by commentary. So far, policymakers have broadly expressed frustration and disappointment with inflationary pressure. There is an anticipation of a rate hike in September, though given the fundamental outlook , the economy during that time may not be able to adequately endure an environment of tightened credit. 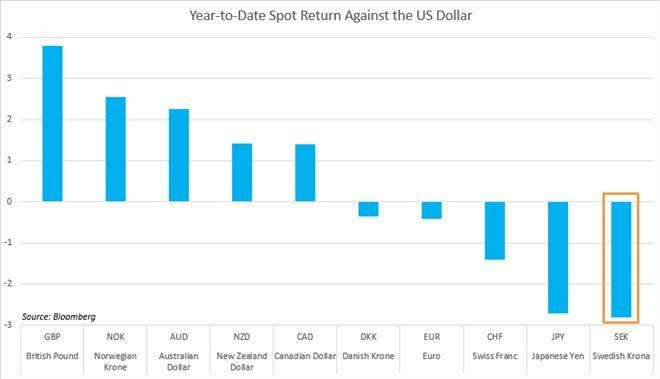 Year-to-date, the Swedish Krona has been the worst performer out of all the G10 currencies against the US Dollar . A major cause is the push back in rate hike expectations as the Swedish economy faces rising domestic risks e.g. household indebtedness , and weaker demand out of a key export partner: Europe. To learn more about the unique political economy of EU-Nordic relations, see my Krona, Krone forecast .